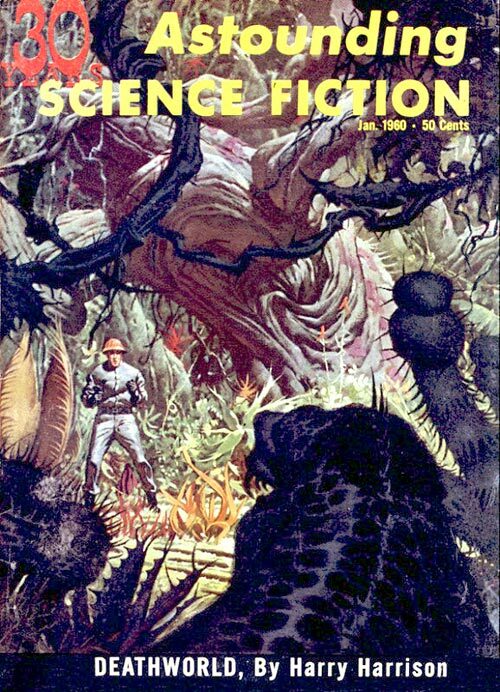 Deathworld by Harry Harrison (Astounding Science Fiction, 1960, 1964, 1968 – see below), Conde Nast Publications, plus various hardcover and paperback publishers. E-book publication (2009-02-04). Deathworld Wildside Press. “Deathworld” is the name of a series of short science fiction novels by Harry Harrison including the books Deathworld (first published 1960, serialized in Astounding Science Fiction), Deathworld 2 (1964, initially titled The Ethical Engineer and serialized in Analog) and Deathworld 3 (1968, serialized in Analog as The Horse Barbarians), plus the short story “The Mothballed Spaceship” (written as part of a tribute to John W. Campbell). The central hero is Jason dinAult, a gambler who becomes involved with colonists of an extremely hostile planet. dinAlt is a professional gambler who uses his erratic psionic abilities to tip the odds in his favor. He is challenged – with a hefty incentive – by the ambassador from the planet Pyrrus, to turn a large amount of money into an immense sum by gambling. He succeeds and survives the planetary government’s desperate efforts to steal back the money but winds up on Pyrrus, which, it turns out, is the deadliest world ever colonized by humans. Pyrrus has a gravity of 2 g; its 42° axial tilt creates severe weather; it is very active tectonically, with frequent earthquakes and volcanic eruptions; and it possesses two moons each creating its own tides that sometimes combine into huge rises and falls of up to 30 meters, that have been known to flood active volcanoes and create even more violent weather. Finally, there have been numerous supernovae in its vicinity, meaning that planets in the area are rich in radioactive ores. Pyrrus is the only habitable planet in the area, and the only one from which efforts to mine the area’s ores can be sustained, making it a world of incredible potential value. The down side? Everything, on the planet, plant, insect and animal alike, is predatory, and capable of killing an unwary human instantly. All large animals are strong enough to destroy small vehicles. All small animals have neurotoxic venom. All plants are carnivorous, even if only by default—their victims fertilize their soil. All microorganisms consume insufficiently protected tissue as quickly as acids. Because of this harsh environment, the settlers are engaged in a ceaseless struggle to survive, which—despite generations of acclimation – they are losing. Restricted to a single settlement, their numbers are less than when the planet was first colonized. The world’s very name is a reference to pyrrhic victory, a success that comes at devastating cost to the victor. After making a futile attempt at becoming acclimated to this harsh world, dinAlt decides it makes more sense to try to solve the planet’s mysteries instead of fighting the losing battle. This is great classic science fiction, a lot of fun to read. Available in older paperbacks and an affordable e-book format, it can be just a click away, and you’ll have a ton of enjoyment in return. Highly recommended! This entry was posted in e-book, Friday Forgotten Book, science fiction. Bookmark the permalink. I read at least two books in this series. Good stuff. I’m a big fan of Harry Harrison. DEATHWORLD was the first Harry Harrison novel I read and it still resonates with me. I read several of these way back when. I remember them fondly and remember the nastiness of the world, although I can’t remember a lot about the plots of the books. Are the Deathworld novels really forgotten/seldom read? Seems just yesterday they were part of any sf reader’s standard library. Thanks for a great account and for treating me to a walk down Nostalgia Alley. Never read this one. I haven’t read much Harrison. Will check it out. OK, I just downloaded the Harry Harrison Megapack (which includes the first two Deathworld books) from Amazon on the Kindle for 99 cents. You can’t beat that deal. Bill, The three books form a complete story, though they can be read separately. I really enjoyed these, which I got as an e-book from the library. George, it’s a good one, and as an early work led to his Stainless Steel Rat stories and then as he developed as a writer eventually to Dune. I like Harrison’s short stories too. Charles, these are worth re-reading in your spare time as a teacher, writer and doer of good deeds. John, you’re welcome. I figure if an SF novel is 55 years old, it’s pretty much forgotten unless it’s by Heinlein or Asimov, and likely even so if it is by them. I wonder how many novels older than 20 years, or even 10, are remembered by the majority of todays SF readers? Jeff, those megapacks are a cool deal for e-book readers. I – shockingly, I know – got it as an e-book from the library. I wanted to see how that worked an it was pretty smooth. I also have the magazines and the SF Book Club edition The Deathworld Novels. Richard, I love the sound of this sf, especially the description of Pyrrus. I’ll check out the ebook version.